Garlic is really easy to grow and tastes infinitely better when it's homegrown. Garlic should be planted in fall, so we sell it only at the correct time. To see what varieties are currently available, click here. Type of garlic to grow. There are hundreds of named varieties of garlic, but they can be divided into two categories: hardneck and softneck types. Hardneck varieties have stronger flavor and easy-to-peel large cloves, but they don't store long. Softnecks have a milder flavor and many small cloves, and they last much longer in storage. If you live in an area with freezing winter weather, you can grow either type but in extremely cold areas may be most successful with the hardneck garlics. If you live in an area with warm winters, little or no spring, then stick with softneck garlics. In most of the United States, gardeners can grow both types successfully. The general growing advice is the same for both. 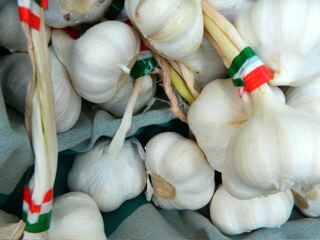 If you would like to learn more about the many types of garlic, read this article on our blog. How much garlic should you order? One pound of garlic produces 5-7 pounds of bulbs under good conditions. That's probably enough for a small family. You may want to grow several varieties to spread out the harvest and storage life. Preparation of area. Garlic needs full sun. Shade while it is growing will reduce the size and quality of the bulbs. So choose the sunniest are of your garden for best results. Garlic prefers soil with a neutral pH (6.8 to 7.0); if you do not know your soil pH, get a soil test from your county Extension service. It's usually free or just a few dollars and it will help you with all your garden plants. Soil should be well worked so the garlic can send down deep roots. Raised beds work well for garlic, especially in places with rainy spring weather that leads to waterlogged ground. At planting time, make a furrow where you will plant the garlic and sprinkle in the furrow some compost, well-composted manure, or soybean meal. In the North, plant six weeks before the ground freezes. You want the garlic to start making roots, but you do not want it to really start growing and send up a shoot. In the South, you can plant as late as the end of December, but you are probably better off planting around the beginning of November or perhaps a bit earlier. Planting. Separate the bulbs of garlic into individual cloves. Plant cloves 6 inches apart, with the pointed up up and covered with about 2 inches of soil over the tip. Water and cover with 3-6 inches of mulch, such as hay, straw or a mixture of shredded leaves and grass clippings. The mulch is critical and will do several things. In the North, it will keep the ground moist and warm so that the cloves will develop roots (If the cloves do sprout, don't worry about them; they will die down in winter but come back in spring.) Mulch prevents soil erosion in winter and it will keep down weeds in the spring. Once you have your mulch spread, leave everything over the winter. Spring. In the spring, you will get shoots poking throught the mulch in early spring, usually about the time you would plant peas. If it's a cold or wet spring, pull the mulch aside until the garlic plants have emerged. If the spring is dry, provide supplemental irrigation. With hardneck garlic in the North, the main shoot is going to curl and have a single seed at the tip. These are called scapes. Cut them off when they form, because you will get larger bulbs if you do. In addition, the scapes are delicious braised in a bit of olive oil. Garlic leaves stop growing around the summer solstice and put their energy into the bulbs. When the lower leaves start to turn brown, it's time to dig the bulbs. Softneck varieties are generally ready for harvest sooner than hard necks. Garlic needs to be cured in a dry, well-ventilated place for several weeks. You can hang it in bunches or spread it on racks. Once it's cured, store permanantly in a cool, dry place and do not let it freeze. Save some of the bulbs for planting next fall. For more details about planting garlic, here is a comprehensive article in Growing for Market magazine. The best book about garlic is Growing Great Garlic by Ron Engeland.